1 When Canada began there was no Manitoba. The land was there of course, but it was open and wild. The only people who lived there were the First Nations. 2 The Hudson's Bay Company owned the area. They called it Rupert's Land. The native people and the Métis became trappers and fur traders. To keep that going, they would only let a few settlers in. If settlers came, it would ruin the fur trade. 3 In 1812 a small colony was given a grant of land. It was for the Selkirk Colony. It was named after Lord Selkirk. 4 Many people in Scotland were forced from their homes. They had nowhere to go. 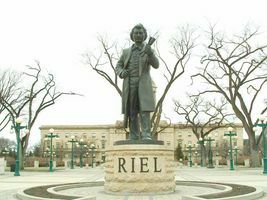 Lord Selkirk wanted to make homes for them in Manitoba. They came to start new lives. 5 The fur traders were not happy. They fought with the settlers. It was several years before there was peace. Some of the fur traders were Métis [MAY-tee]. They were a mixed race people of mostly French and First Nations. They often lived in log homes and spoke French. They hunted their meat and traded animal skins for other things they needed. Over the years, the Métis and the Scots became friends. Soon the area became known as the Red River Settlement. 6 The land was very good for farming. Other people wanted to move there. Many of them were from Ontario. They liked the land. 7 The Métis were unhappy about all the new people. They did not have legal papers saying they owned the land they lived on. They were worried that they would lose what they had worked for. 8 Canada wanted this new land to join Canada. The Métis wanted to know what rights they would have first. They would not join until they had problems worked out.